NOVEMBER 23--According to British tabloids, Prince Harry is hoping to book hip-hop star Snoop Dogg for a 2011 engagement party celebrating his older brother Prince William’s marriage to Kate Middleton. 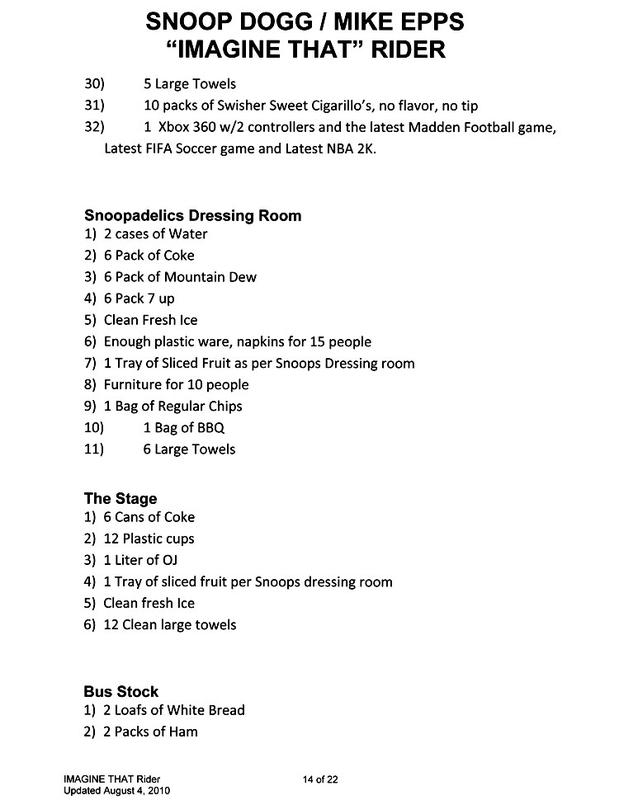 But the royals may want to check out the MC’s contract rider before bringing Snoop (real name: Calvin Broadus) to the palace stage. 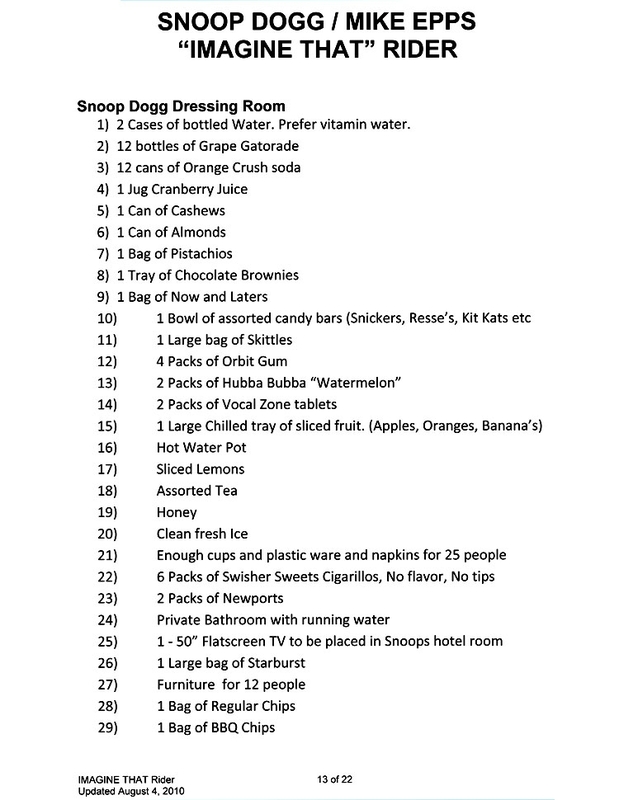 Among his list of demands, Snoop--who once rapped about smoking “‘til your eyes get cataracts”--directs promoters to stock his dressing room with sixteen packs of Swisher Sweets cigarillos (“No flavor, No tips”). 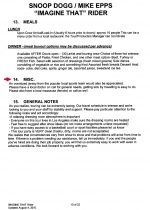 Excerpts from Snoop’s 2010 rider can be found here. These 80 smokes (five come to a pack) will, of course, be crammed with the best marijuana available in the British Empire. Or the best marijuana that can be smuggled past customs agents. 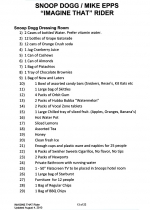 To counteract the subsequent munchies, the 39-year-old performer requests an array of snacks, including a tray of chocolate brownies, assorted candy bars “(Snickers, Resse’s, Kit Kats etc),” and bags of Skittles, Now and Later, Starburst, and potato chips. 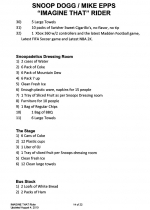 Other demands on Snoop’s 2010 rider include the provision of “1 Xbox 360 w/2 controllers and the latest Madden Football game, Latest FIFA Soccer game and Latest NBA 2K” and “an oversized jersey from the popular local sports team.” Perhaps the princes could procure a Wayne Rooney Man U jersey at a reduced price. Submitted by Dr Spaceman on Sun, 2010-11-28 05:51. "Or the best marijuana that can be smuggled past customs agents." ... snoop wouldnt be that stupid. he'd have weed hookups in the uk.. Submitted by Snowgoose on Wed, 2010-11-24 17:28. @jjesselli you might as well fix the error in the heading to this story in the newsletter which begins: "Before Prince William books Snoop Dogg for his brother's engagement party. . . "
Submitted by ferdw on Wed, 2010-11-24 13:20. I'm a little surprised; TSG is usually pretty meticulous about detail and accuracy. I realize that phrases in quotation marks usually include source misspellings. I noticed here, however, that 16 packs of five Swisher Sweets seem to be magical in that they contain 90 smokes instead of the usual 80 that normal math would provide. Oh well, we all make mistakes. Submitted by jjesselli on Wed, 2010-11-24 13:50. We've fixed the math error. Thanks for keeping us on our toes, er, fingers. Submitted by Cruella on Wed, 2010-11-24 19:42. Heh heh, I believe that would be arithmetic, not math, Smoking Gun. Submitted by M4P on Sat, 2010-11-27 03:46. Really? A Reference would be nice here. I don't see anything wrong with "fix the math". If I and TSG are so wrong, please provide a reference so that we may all learn something new tonight. I may be a Grammer Nazi myself, but before I accept a rule that's new to me, I'm going to need some proof. Submitted by Cataracts420 on Fri, 2011-02-11 00:11. I think you mean "Grammar Nazi," though I'm not sure I'm comfortable with that casual association in the first place.